I’ve been thinking about this whole amateur sleuth thing. I’ll admit I’ve been reluctant to call myself a detective, especially when the professionals (read: Deputy Clod Dunbar) make cute remarks about Nancy Drew. But after solving three cases before the professionals (take that, Deputy Clod,) it’s time to stop arguing with success. 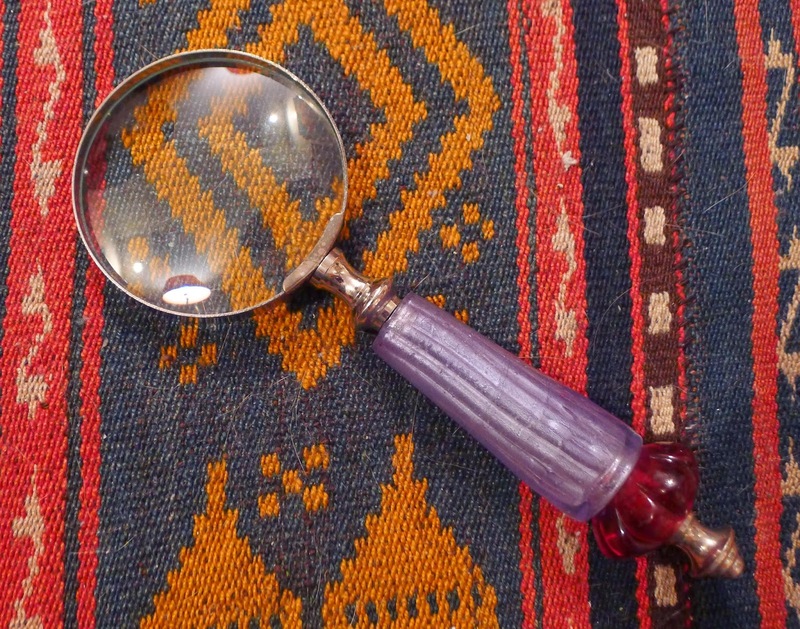 So what does it take to be a successful amateur sleuth? For me, first and foremost, it takes friends, and the members of TGIF (that’s Thank Goodness It’s Fiber, the needle arts group that meets at the Weaver’s Cat, my fiber and fabric shop here in Blue Plum, Tennessee) fill that role perfectly. They provide legwork, loyalty, and a variety of skills, talents and expertise that are invaluable to our investigations. I’m honored they consider me their leader. I’ve gotten us into a tricky situation or two, but so far so good . . .
What else does it take to be a successful sleuth? It helps if you like to solve puzzles and are interested in other peoples’ lives. In other words, it takes someone who’s nosy and willing to pry. Am I those things? I think I’ll have to raise my hand and answer yes. Does being a sleuth require special equipment? A computer with Internet access and a camera are useful. Notebooks come in handy, too. And a magnifying glass is just plain cool. What about a ghost? Wouldn’t you think a ghost, who’s able to be the proverbial fly on the wall, would be an asset to a detective? She could eavesdrop on private conversations. She could enter locked rooms and look around. Then she could report back, making the life of the amateur sleuth super easy. Sadly, it doesn’t work that way. Geneva, the ghost haunting the Weaver’s Cat, far from being the secret weapon in my Stealthy Sleuth Tool Kit, is instead the ultimate unreliable witness. But please don’t tell her I said that. I don’t want to hurt her feelings. But I wonder if there’s some way I can improve her reliability? She hasn’t got a good sense of time and she’s easily distracted, but maybe there are strategies I could use, or that she could learn, that would help solve those problems. Of course, I don’t anticipate having to solve any more murders, but one never knows. Our author told me we have another book coming out in November called PLAGUED BY QUILT, and she just started typing away at another one. So what do you think? Do you have any suggestions for helping an unreliable ghost become more responsible? Any ideas will be appreciated! 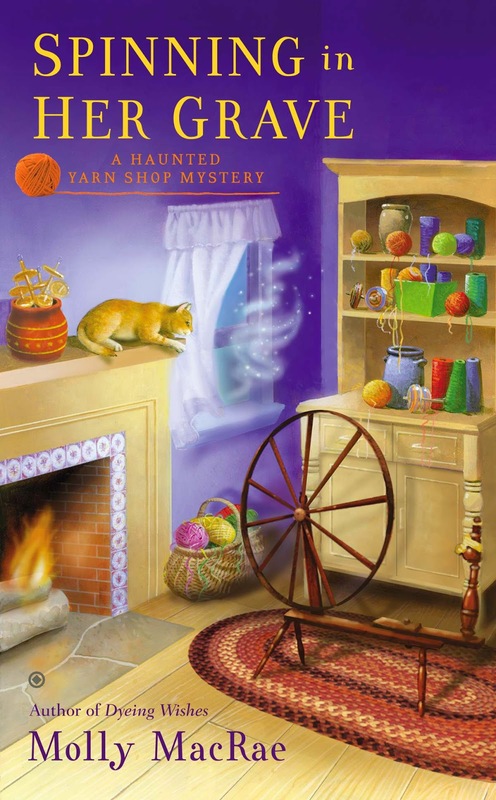 Kath Rutledge’s latest adventure is the national bestselling SPINNING IN HER GRAVE, third book in the award-winning Haunted Yarn Shop Mysteries, which are available in mass market, e-book, large print, and audio wherever books are sold.